There are some days you just can’t catch a break. There are days when you just aren’t impressed with yourself. There are days when you wish you could just send yourself outside to play. An article entitled “Dealing with Challenging Personalities” looked pretty interesting to me and I decided to read it. It’s in the May Toastmasters magazine. It started out, “We all know them: the club members who irritate, agitate, and aggravate others. Maybe it’s their strong personality or annoying behavior…. They are maddening!” And then the article proceeded to talking about the personalities and how to work with them. They named seven type of maddening members. The Over – Talker. This person “talks endlessly, barely stopping to breathe in conversation, unaware that their listener has zoned out and lost interest. They can come across as opinionated, disrespectful, and extremely self – absorbed. The Recruiter. He uses every opportunity for “a personal networking or proselytizing event to market their own business or evangelize their own faith. Every conversation and comment is sprinkled with a thinly veiled attempt to gain more clients or converts. The High Conflict person is toxic. They “exhibit behavior consistent with narcissism and histrionic, borderline and antisocial personality disorders. They argue, debate, even intimidate. They often initiate, escalate, and perpetuate conflict, usually with themselves at the center. They blame others and will not take responsibility for their part in a conflict. They think people are either with them or against them, or 100 percent good or 100 percent bad. If anyone is against them, they’re forever against them. They can be explosive and unpredictable, and will try to gather allies in their conflicts, often creating division in a group. “The Latecomer is consistently late. When on the agenda, their tardiness causes last minute role shuffling. Even if they are not on the agenda, their arrival is disruptive and distracting. “The Gossiper delights in passing along juicy information about someone else. The information may be true, but it’s rarely flattering. Gossips speculate, criticize, and divide. I don’t know about you, but I saw myself in about half of those people. I thought maybe I should read the part on how to deal with them, but then I changed my mind. I think I’m stuck with myself. If I haven’t learned in 58 years how to deal with myself, it doesn’t seem likely. Lots happening this summer. What are you looking forward to? I’ll see you on the bricks! My mother is a beautiful 80 – year – old woman. She’s married to Bob and she is smart as a whip. She is also half a step from being a perfectionist and being raised by her wasn’t easy, although she certainly tried to teach me how to work hard and well and to be socially acceptable. I wasn’t always a good learner. Mama is different these days than she was when I was young. She is more accepting and more forgiving, more positive and just generally more relaxed. And I like the new Mama. The last couple of months she has had yet another transformation. She is crazy about Walter. She calls me sometimes to tell me the wonderful things that Walter does. Walter is a rescue Schnauzer who has found the good life. Mama feeds him and waters him, has a backyard that he owns, and he has the run of her immaculately clean house. She buys him toys and any day I’m expecting a collar with jewels. We’ll see. Last night he slept with Mom and Bob … under the blankets. Yes, she called and told me. Who is this person that used to be my mom? I don’t know, but I really enjoy her. Probably not as much as Walter does, but close. When we get to retirement age and go on into retirement, it is a life change that we really need to prepare for. Recently I read an article that a man wrote about his retirement. H decided to devote more time to photography; reread One Hundred Years of Solitude and every mystery written by Dashiell Hammett and Raymond Chandler; and to learn the guitar riff or the first 10 bars of every Beatles song. And he did all that and then said he had a “what now?” moment. “I had simply spent more time indulging existing talents and interests,” said James Petersen. “And none of those goals took me out of the house, involved other people, or kept me connected. I was no longer taking risks. “The learning curve, I realized, should lead somewhere.” He explained further. “A friend who took up online dating apparently mixed up his likes and dislikes in his profile. It took him months to notice that the women he was meting were drawing him into activities he had previously avoided – and that he was enjoying himself. “The learning curve should lead you out of the house. “I have attended Story Slams … sat in intimate Irish pubs being moved to laughter or tears or heartache by the sound of human voices. “Find a microphone. Tell your story. This campfire has been burning for millennia. It is human connection in its purest form, the exact opposite of what often happens in social media. “For most of my life I was inclined toward adrenaline sports, velocity. Then I inherited a garden. Over the past few years I have built a vocabulary and a library of reference books. I’ve started a calendar, photographing the arrival of bluebells, lilies, wood anemones, lobelias, bleeding hearts, astilbes. If this is July, that must be echinacea. I have seen plants change in the course of a day. I have sat in the backyard watching the fireflies rise. Facing a challenge ignites the brain. To have full engagement, focus, and enjoyment, you have to tackle challenges that are just beyond your abilities, that are new. Feeling challenged? Wondering what you can do that is new? Want to visit about volunteering? Would love to talk to you about it! 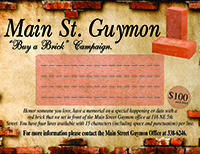 One of the challenges that might be perfect is to get involved with the Guymon Community Theatre. They have a play this weekend. Go check it out. You might challenge yourself to expanding your culinary skills. Virgil Gibson is teaching a cooking glass through the All Fired Up Gallery on May 31. Think on it. This could be great fun. And I hope I’ll see you on the bricks while you’re pondering!